The Energy Independence and Security Act of 2007 enacted a federal renewable fuels standard (RFS) in order to increase rural economic activity and reduce U.S. dependence on imported liquid fuels. One mandate contained in the RFS is that the United States will consume 100 million gallons of ethanol produced from cellulose in calendar 2010, rising to 16 billion gallons in calendar 2025. In order to qualify as cellulosic ethanol, the fuel must be derived from any cellulose, hemicelluloses, or lignin that is derived from renewable biomass and that has lifecycle greenhouse gas emissions that are 60 percent less than baseline (i.e. gasoline) greenhouse gas emissions. This looming mandate, combined with the continuing food vs. fuel debate, has resulted in increased interest in cellulosic ethanol production. The potential feedstocks for cellulosic ethanol are many and varied, from specialty energy crops, such as miscanthus, to crop residue, such as corn cobs and stover, or municipal waste. This report was commissioned to analyze the availability, cost, and potential environmental effects of potential agricultural feedstocks for cellulosic ethanol production in northwest Ohio—specifically the counties of Allen, Defiance, Erie, Fulton, Hancock, Hardin, Henry, Huron, Lucas, Ottawa, Paulding, Putnam, Sandusky, Seneca, Van Wert, Williams, Wood, and Wyandot. Of the potential feedstocks, this study analyzes corn stover, corn cobs, wheat straw, and miscanthus. Switchgrass was not analyzed, as most observers believe that miscanthus is, in the long run, a better cellulosic feedstock. Soybean straw was omitted because the extremely low quantity available per acre makes its use as a feedstock undesirable for all but the most pathological price scenarios. This study builds on the previous work of Jeanty and Hitzhusen to estimate quantities available. For each potential feedstock, a number of dimensions will; be presented: production season, current production and use, prices, changes required for commercial-scale production, and the environmental effects of production. 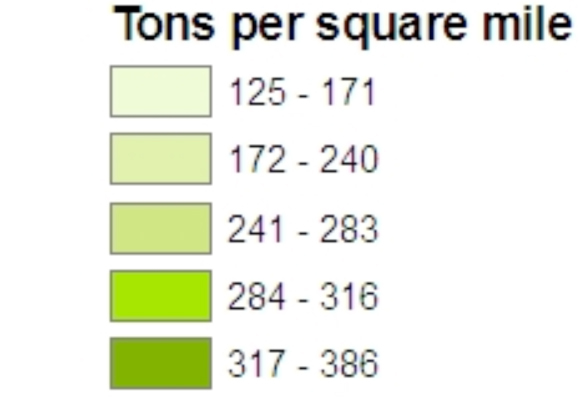 Finally, quantities, by county, of each type of biomass are presented. The corn plant can generally be divided into two parts for the purposes of biofuels: the kernels and everything else. The kernels, or grain, are very high in starch, and are desirable as an energy source for animal feed, human food use, and ethanol production. The remainder of the plant, consisting of the cob, stalks, and leaves, are collectively referred to as stover. The stover is high in cellulose, hemicelluloses, and lignin, and is therefore a potentially rich source of energy for cellulosic ethanol production. In northwest Ohio, corn stover production season begins in late September when early maturity varieties of corn begin to be harvested. Stover harvest can continue throughout the fall and early winter. Harvest is only possible when soil moisture levels are acceptable for field operations—when soil moisture levels are too high, harvesting equipment excessively compresses the soil, adversely affecting yields in the following year. Wet soil conditions make it unlikely that stover could be harvested in the early spring and as soon as moisture falls to acceptable levels, planting operations will begin. For these reasons, most believe that stover will either need to be harvested simultaneously with the corn, or soon after. At this time, we estimate that no more than one percent of the stover in northwest Ohio is actually harvested. This stover is typically collected into large round bales used for feed and bedding in cattle and dairy operations. Current forage harvesting equipment can create large round bales or large square bales. Large round bales are 5–7 feet wide and 5–7 feet in diameter, depending on the equipment manufacturer, and typical y weigh 1,200–2,000 pounds. Large square bales typically measure 3 x 3 x 8 feet to 4 x 4 x 8 feet and weigh 1,000–1,500 pounds. Large square bales are more compact for handling and storage. The machinery needed for harvest is an adequately powered tractor, a large bailer, and a forklift to load bales on flatbed trailers for transportation. All of this equipment is already relatively common in northwest Ohio. A large cellulosic industry would require additional purchases, but current infrastructure could likely support a modestly sized industry. According to Larson, English, and Lambert (2007), in order to achieve significant stover harvesting, $30 to $45 per dry ton needed to be offered to the farmer excluding transportation costs. As offered prices increased, the limiting factor to quantities available became the time available for harvest. From the field to on-farm storage will require flat-bed wagons or flat-bed tractor-trailer combinations. Long-term storage will require a high roof pole barn that can accommodate the dimensions of bales stacked as high as forklift capacity. The flooring of the barn must be specially constructed to prevent moisture build-up that would cause bales to mold or rot. While expensive, concrete flooring is likely to be the most reasonable option. Corn cobs are frequently mentioned as a source of cellulosic material for ethanol production instead of stover. The primary advantage of cobs is that they are relatively denser than stover and they contain fewer nutrients; therefore, harvesting cobs has less adverse impact on soil quality. The primary disadvantage of harvesting cobs is that they must be harvested simultaneously with corn, and specialized machinery will be required to harvest cobs with sufficient speed so as not to slow the corn harvest, and in sufficient quantity. A number of machinery manufacturers are currently testing equipment that will permit cob harvesting at the same time as corn. Many of these implements are wagons that process the stover after the kernels are separated and keep the cob, but not the leaves and stalks. These implements will require another wagon to be towed through the field at harvest, increasing soil compression and combine horsepower needs. These wagons are specially built for this task, and so the prices for cobs will need to justify the investment in such specialized equipment. For these reasons, cobs are not currently harvested in northwest Ohio. It is difficult to estimate the final price that needs to be offered to farmers to induce cob harvesting, as the machinery costs are not knowable—all harvesting machinery is currently in prototype. Because cobs have fewer nutrients, farmers are much less resistant to harvest on agronomic grounds than stover, but the actual harvest process is likely to be more intensive. Therefore, it seems likely that the long-term cost of cob-only harvesting will be lower than stover, but in the short-run, until machinery has been on the market long enough to gain acceptance, it will remain significantly, if not prohibitively, more expensive than stover or straw harvesting. Wheat straw is the stem of the wheat plant, and is left behind in the field following harvest of the wheat grain. At this time, we estimate that approximately 25% of wheat straw is harvested in northwest Ohio. Most of this straw is harvested for small square bales, which are used for recreational livestock bedding. Some becomes large round or square bales for use by cattle and dairy operations for bedding and/or feed. In northwest Ohio, wheat harvest typically begins in early July and concludes by mid-July. The short (two-week) harvest is a result of the relatively few acres of wheat planted in northwest Ohio and that harvesting equipment is typically sized for the corn and soybean harvest, which have many more acres. Straw harvest can continue after grain harvest well into August or early September because of the hot, dry conditions. However, rainfall during this period will reduce straw quality. As a significant amount of straw is already harvested in northwest Ohio, farmers are familiar with the agronomics and equipment needs. The current capital stock is capable of harvesting a significantly larger quantity of straw than is currently harvested. Straw prices vary with annual yield, but are typically priced at approximately $60 per ton—it is likely that prices not far above this level could generate significant additional quantities of wheat straw, but farmers would need to be confident in the market for their production. Therefore, pre-planting or pre-harvest contracting would likely be required in the short run. Giant Miscanthus (Miscanthus x giganteus) is a perennial warm-season grass, with a growing season that begins in late April and is completed as it goes dormant following the first killing frost, usually in October. In long-term field trials at the University of Illinois, Giant Miscanthus has produced more than double the biomass of upland switchgrass per acre. Growth each year originates from the buds on scaly rhizomes. Established plants typically reach more than 6 feet tall by the end of May and greater than 12 feet at the end of each growing season. As temperatures cool in the fall, the dark green foliage fades to buff and drops, leaving stems. Stems are the most commercially important portions of Giant Miscanthus, and harvesting the dried stems takes place during winter. Harvestable stems resemble bamboo and are usually ½ to ¾ inch in diameter and more than 9 feet long. Stems have been harvested using hay cutters and balers. Illinois yields have varied depending on the crop age and the weather during the growing season. At three Illinois sites in replicated studies, the end-of-season biomass yields of unfertilized Giant Miscanthus planted in 2002 averaged over the 2004, 2005, and 2006 growing seasons were 9.8 tons per acre in northern Illinois, 15.5 tons per acre in central Illinois, and 15.8 tons per acre in southern Illinois. Currently, there is no Giant Miscanthus being grown in Ohio. One disadvantage of Giant Miscanthus is that it is a sterile plant, and must be propagated via rhizome division, instead of through the planting of seeds. This will slow the number of acres that could be newly planted in any given year, but once a stand has been planted, it should be productive for at least ten years. Because the productivity of miscanthus in Ohio is still uncertain, inducing farmers to begin production will also probably require contracting. If yields on marginal soils approach 6–9 tons, then pricing of $50–$60 per ton should provide adequate incentive to begin production. The removal of plant residue for cellulosic ethanol production will have a negative impact on soil quality. Essential plant nutrients are contained in crop residue, which are returned to the soil through decomposition. If these nutrients are removed through biomass harvest, then a replacement source of these nutrients must be added back to the soil, which is a cost that a farmer will consider when making planting decisions. Further, plant residue adds to the organic matter content of soil. If residues are removed, then soil organic matter may decrease, which also limits crop productivity. Compaction caused by equipment used for the extra harvest operation of residue removal will also negatively affect soil quality. Cover crops may be planted after residue removal to help alleviate soil quality problems. These are relatively well-understood and solvable problems when biomass is harvested in sustainable quantities. Although some researchers assert that all biomass should be left on the field, most believe that 25–30 percent of stover can be sustainably harvested, or all of the cobs, or all of the miscanthus. The quantity of crop residues available to a potential cellulosic ethanol plant in northwest Ohio are estimated by county in Li and Reeder (2009) using data from 2005 and 2006. Table 1 combines Li and Reeder's data with estimates of CRP harvest. They assume that 35 percent of stover and straw are harvested from all corn and wheat acres in each county, and that corn stover produces 73 gallons of ethanol per short ton and wheat straw produces 70 gallons of ethanol per short ton. When the area of each county is considered, the ethanol potential from crop residue per square mile can be calculated. These calculations are presented in Table 1. For a relatively small ethanol plant, the ethanol potential density from crop residue is most important. Fulton County has a total crop residue potential of 11.2 million gallons per year, and the highest density, of 27,614 gallons per square mile. Likely the first source of land for production of energy crops would come from land currently enrolled in the Conservation Reserve Program. These are lands that are leased to the USDA because they are environmentally sensitive or erodible. These lands are classified as being harvestable or non-harvestable. Table 1 reports the number of short tons of biomass from harvestable CRP acres. 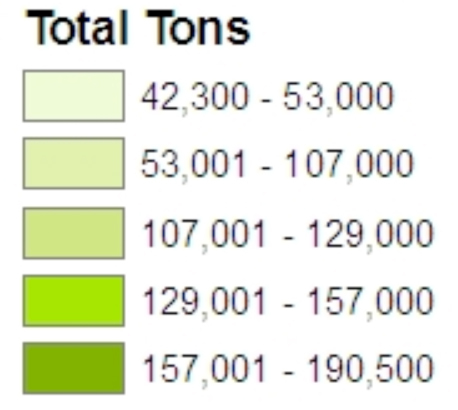 The tonnage is calculated based on the average number of harvestable acres between 2004 and 2008, assuming that 7 tons per acre are harvested. While 7 tons per acre is significantly below the average yield for the Giant Miscanthus tests in Illinois, the 7 tons per acre permits some of the biomass to remain unharvested for soil quality and/or wildlife habitat. When potential biomass harvested from CRP is added into the calculation, the total quantity of biomass available increases by about 6 million gallons of ethanol potential. The average density of ethanol feedstock increases by 800 gallons per square mile. Agriculture in northwest Ohio has a large amount of potential biomass currently available for harvest. The high levels of corn and wheat production mean a significant amount of cellulose is available for collection, even after leaving sufficient amounts to maintain soil quality. If all of the biomass were collected from the 17-county area examined here, 163 million gallons of cellulosic ethanol could potentially be produced. It is unlikely, however, that such a level of collection could be achieved. Instead, as prices increase to incentivize more collection, land enrolled in CRP will likely begin production of dedicated energy crops. Larson, J. A., B. C. English, et al. Economic Analysis of the Conditions for Which Farmers Will Supply Biomass Feedstocks for Energy Production. Ames, IA: Agricultural Marketing Resource Center, 2007. Li, Y., and H. Keener. (2009). County-Level Analysis of Crop Residues Availability for Fuel Ethanol Production in Ohio. Transactions of the ASABE. Vol. 52(1): 313–318. Li, Y., and R. Reeder. (2009). Crop Residues for Ethanol Production in Ohio, Ohio State University Extension fact sheet. McKendry, P. "Energy Production from Biomass (Part 1): Overview of Biomass." Bioresource Review 83 (2002): 37–46. Perlack, R. D., L. L. Wright, et al. (2005). Biomass as a Feedstock for a Bioenergy and Bioproducts Industry: The Technical Feasibility of a Billion-Ton Annual Supply, U.S. Department of Energy and U.S. Department of Agriculture.